The Lilydale township is 35 km east of Melbourne, and is situated centrally in the former Lillydale shire which was amalgamated with three others to form the Yarra Ranges shire in 1994. The town is spelt with one ‘l’ and the shire was spelt with two. The first European settlement in the district was in the flatter, less forested northern part of the shire, adjoining the southern side of the Yarra River, in the late 1830s. That area now comprises Yering and Coldstream. The discovery of gold in the upper Goulburn River and Woods Point areas in the late 1850s caused the formation of a miners' access track. The place where the Woods Point Road crossed the Olinda Creek was chosen for a town survey. The origin of the name is uncertain. One version is that the Government surveyor, John Hardy, suggested that the town be named Lillydale after his chainman was heard singing a popular song ‘Lilly Dale’. The name was also inspired by the surveyor observing lilies growing in pools of the creek. The less likely versions are that Paul de Castella’s wife was named Lilly and that lilies were seen growing in pools. 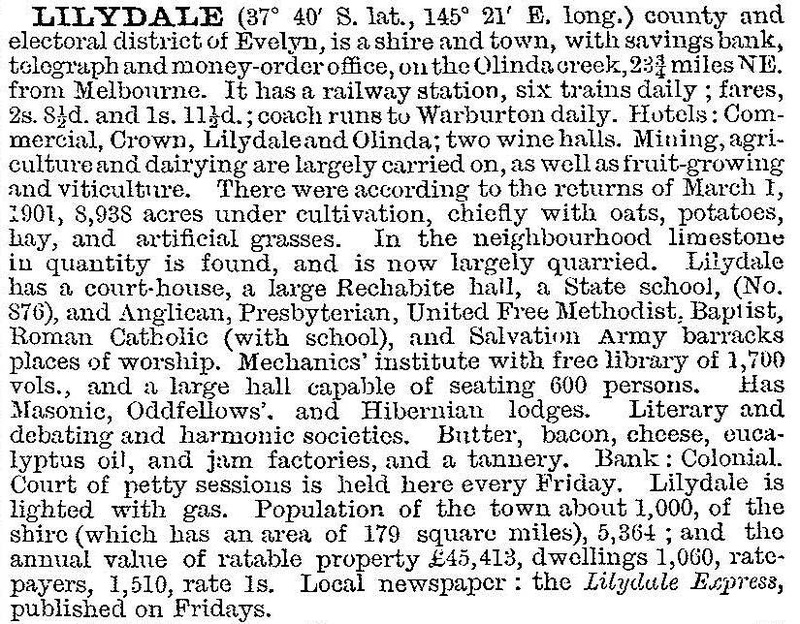 Council clerks and the local schoolmaster shortened the spelling to Lilydale. Land sales in the town were held in 1860 and within two years there were a post office, a store, a butcher's shop and a hotel. The traffic along the Woods Point Road stimulated business investment in the town in the 1870s and it became a sales centre for livestock from the Coldstream area. The northern area was planted with several vineyards which are discussed under Coldstream. Smaller vineyards adjoined the township. The township's growth was stimulated by the opening of the railway line from Hawthorn in 1881, which brought excursionists. They patronised new guest houses, hotels and local food products. The railway carried manufactured goods and raw materials from brick works and quarries. A notable producer was David Mitchell at his Cave Hill limestone quarry. He was the father of Dame Nellie Melba (Helen Mitchell), and diversified into soap and foodstuffs factories at Cave Hill. Later he acquired several of the vineyards at Coldstream. De Castella Street became the town’s civic centre, with the court house (1876), primary school (1876), Baptist church (1881), Wesleyan church (1887), mechanics’ institute (1888) and shire hall (1889). 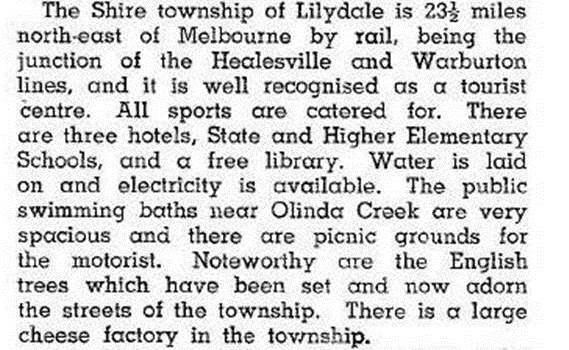 Lilydale's proximity to Melbourne made it dependent on the metropolis for its economic well being. A change to growing oats and hay was thrown into reverse as motor lorries replaced horses and drags in the 1920s. A further change to small dairy operations was hampered by farmers not being able to afford statutory health improvements. Larger sheep and cattle acreages replaced some of the small holdings. In the 1920s the townspeople felt the need of a bush nursing hospital and organised a monster back-to celebration over Easter in 1931. In a year when prosperity was at a low ebb many back-to visitors were apparently prepared to be ‘fleeced’ for the cause. The agricultural show has been a continual event, despite urbanisation, and the Lilydale market with fresh-food and household foods stalls also continues. The shopping area was a main-street strip until 1999 when a Stockland drive-in centre was built on the market site. (The market moved to Bellbird Park.) Several secondary schools service Lilydale and its surrounding districts, including the Catholic Mount Lilydale Mercy College (1896), Lillydale Heights College (former technical school, 1970) and Lilydale High School (1919). There are also a TAFE and a Swinburne University campus (closed 2013). Lilydale Lake and adjoining parkland provide a large recreational area. Lilydale was a change-trains station for the railways to Healesville (1889-1981) and Warburton (1901-1965). The station included an elaborate refreshment room which has since been heritage-listed. After the 1980s Lilydale’s residential areas expanded to beyond walking distance to the station, southwards towards Mooroolbark and northwards beyond Nelson Road to the lawn cemetery.